Most of you may be familiar with the name Great Wolf Lodge and automatically think of an indoor water park. Well, you would be absolutely right! The new Great Wolf Lodge in Georgia offers the awesome indoor water park fun that you might expect plus the new Great Wolf Adventure Park with even more family fun opportunities. 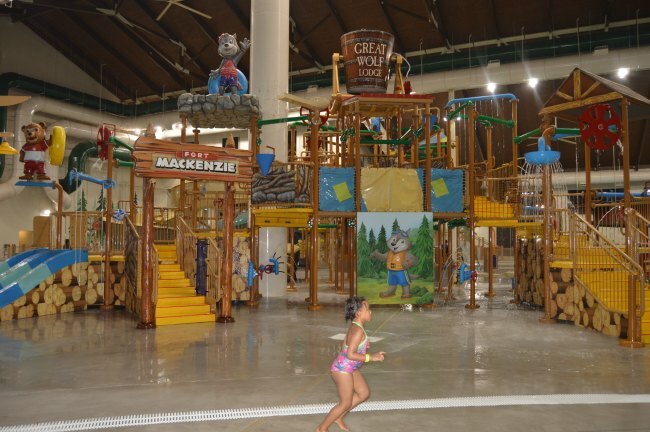 The Great Wolf Lodge Resort is truly like an indoor amusement park for the whole family. 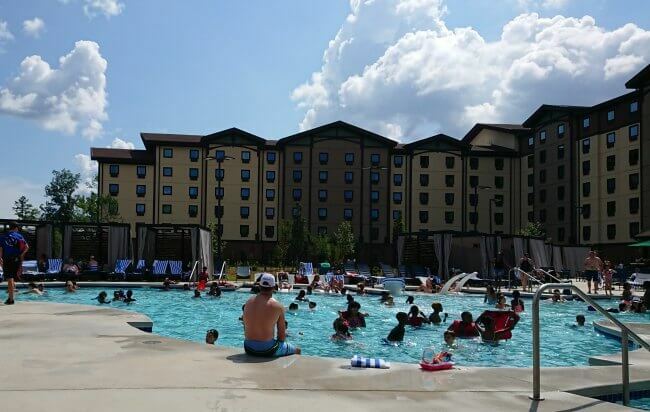 When my kids and I were offered a chance to stay at the new Great Wolf Lodge in Lagrange, Georgia, in order to facilitate review, they jumped at the chance! Great Wolf Resorts are North America’s largest family of indoor waterpark resorts and the new Great Wolf Lodge in Georgia makes sweet 16 for the number of Great Wolf Lodges you can visit. My son and I had been to the Great Wolf Lodge in Kansas City, Kansas so he was so excited to go again and my daughter was excited to be able to catch up on what she had missed. The new Great Wolf Lodge is located in LaGrange, Georgia, which is about an hour from Atlanta and about 5 hours from Nashville. It just opened at the end of May 2018 and it is already booked near capacity! One of the cool things about the Great Wolf Lodge, is that it is always fun, no matter the time of year or outdoor weather conditions. You can enjoy the water slides and attractions in the almost 100,000 square foot water park if it is sweltering out or snowing out! The Great Wolf Lodge Georgia Resort has 457 guest suites and nearly 500,000 square feet of entertainment space and lodging amenities. With games, attractions, activities, spacious suite options, on-site dining, on-site shopping, and Camp Howl Club, Great Wolf Lodge Georgia makes it super easy for a family to have a hassle-free, fun, memorable vacation for the whole family. Parents don’t have to worry about parking and getting to and from locations, everything is on-site and at your leisure from your hotel room to your food to your entertainment. High-thrill water slides area with family rides like Triple Thunder and River Canyon Run as well as individual rides like Rapid Racer, and Wolf Tail. Obstacle Course and Basketball hoops water area. Zero depth entry pool and little kids water slide area. Fort Mackenzie, a multi-level, indoor interactive water fort treehouse. Adult-only outdoor oasis area complete with relaxing chaise lounge chairs and a private hot tub for parents to enjoy. 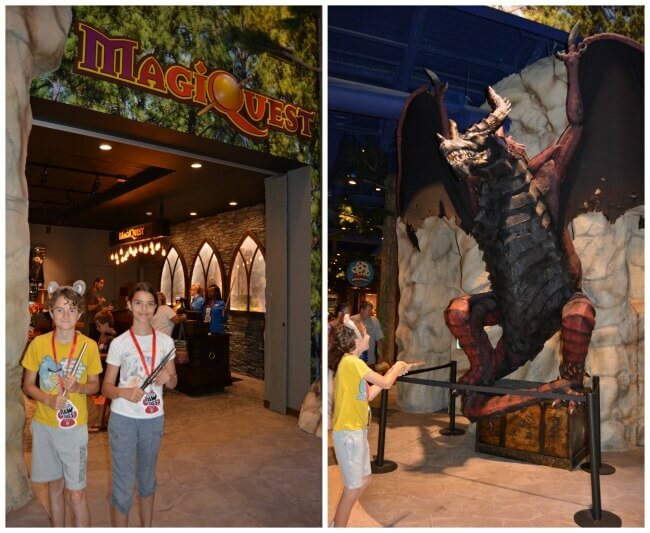 MagiQuest is The Great Wolf Lodge Resort’s exclusive live-action adventure game where kids can scour the resort using magic wands to uncover relics and runes needed to defeat dragons and goblins. I saw little tiny kids wandering around and their faces would light up as they pointed their wands and watched things light up or make noises. My kids are 11 and 13 and they really enjoyed the scavenger hunt element and the strategy involved. Howlers Peak Ropes Course. This is a really fun or really terrifying aerial ropes course depending on who you ask. My 13 year old loved it and went twice but my 11 year old, who is afraid of heights, said he never wanted to go again in his life! I wanted to try it out myself and adults are allowed on the course but you must have closed toes shoes, so remember to pack those! Howl In One Miniature Golf Course. 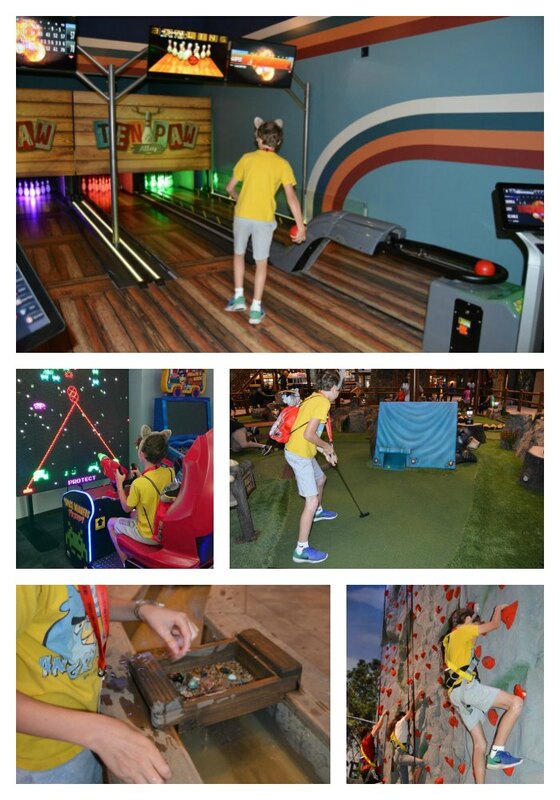 9 holes of mini golf that are fun for the whole family. Ten Paw Alley family bowling. Ridiculously fun mini bowling. Kids will love being able to actually control the ball and it makes it challenging for adults too. Northern Lights Arcade. We enjoyed the classics like Space Invaders, air hockey, and skee ball. Oliver’s Mining Co. Your child gets a bag of pre-loaded dirt and rocks so they can pan and sift their way to finding the beautiful gemstones and minerals. It comes with a gemstone identification card so your child can learn about their finds and I was impressed with just how many goodies she found! 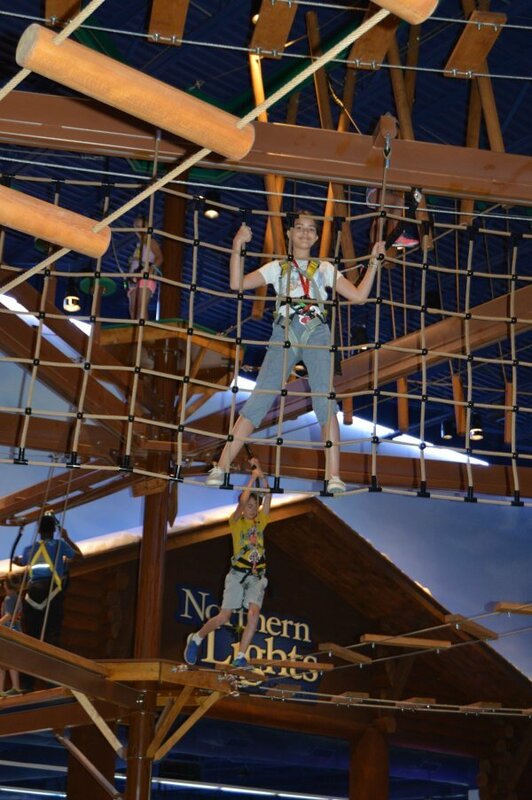 All of the Great Wolf Adventure Park attractions are available at an additional fee. Check out the Pup Pass, Paw Pass, and Wolf Pass packages for discounted attractions. 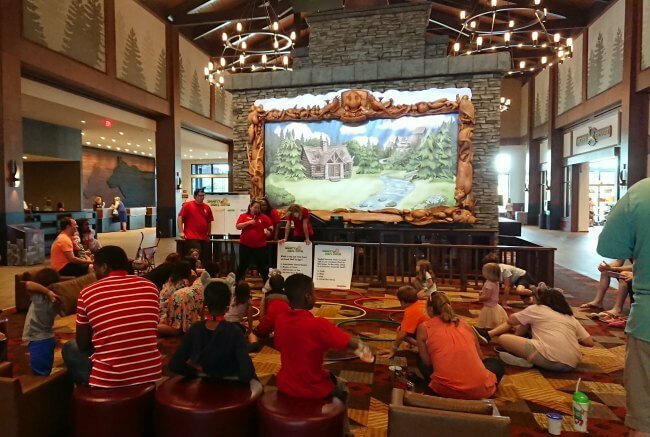 Besides all the attractions, Great Wolf Lodge Resort guests have access to free daily activities the kids will love like Yoga Tails, Face Painting, Story Time with Character Appearances, Jammie Jamborie and more. There is also a paid Camp Howl option where guests may leave their kids at Camp Howl while they enjoy an evening at the resort to themselves. 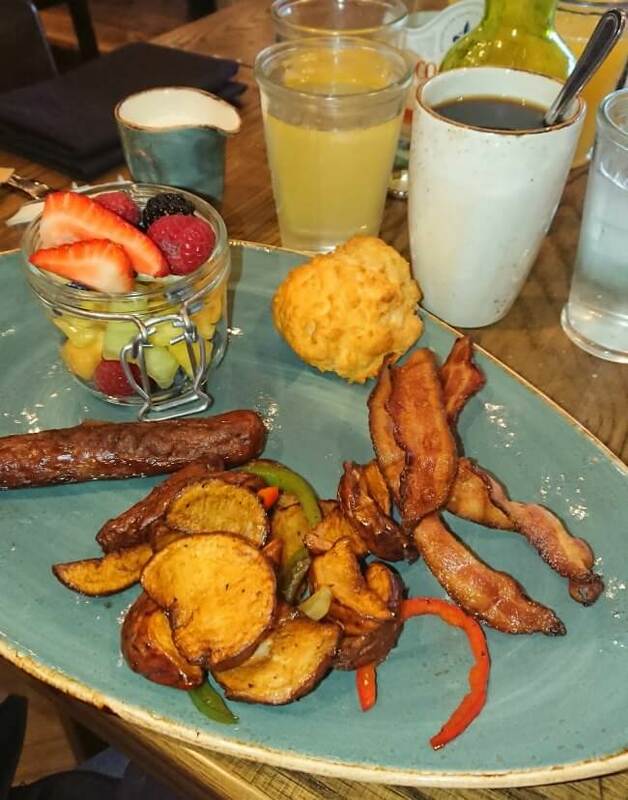 The Great Wolf Lodge In Georgia has multiple dining options, including Barnwood, whose menu is sourced from within a 100-mile radius of the resort ensuring freshness and an ever-changing array of dishes based on seasonality. You can also find Buckets, Campfire Kitchen (cafeteria style), The Watering Hole, Dunkin’ Donuts, Timbers Tacos, Freshwoods Market, Ben & Jerry’s, Outpost, and Hungry as A Wolf pizza. Buckhorn Exchange, Paddle Outfitters, and Great Wolf Candy Company offer plenty of neccesities and souvenirs from clothing to candy! Creation Station lets your child create their own stuffed animal from stuffing it to dressing it. The have a Flip Flop Workshop coming soon! 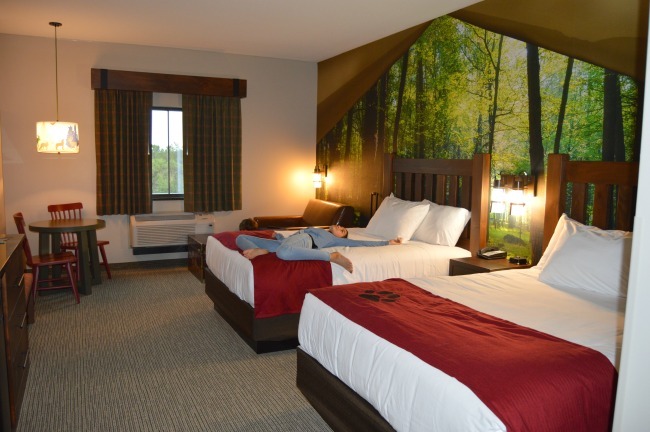 The standard rooms have a Northwoods-inspired feel with wall decor that makes you feel like you are camping outdoors! They also have themed rooms with wolf den or kids cabin decor. There is no doubt that The New Great Wolf Lodge in Georgia is fully equipped for family fun. 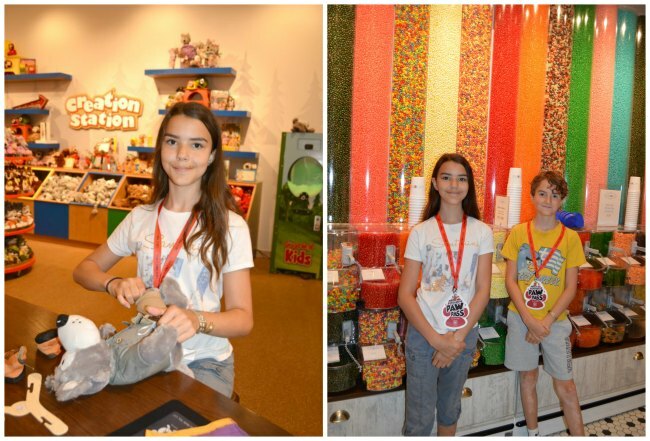 My kids and I really enjoyed our quick trip for an adventurous good time! It was perfect for my older kids and my friend who was there with her younger kids said it was perfect for them too. She loved not having to worry about car seats and transportation and having the hotel room right there if one of her kids needed a nap time. 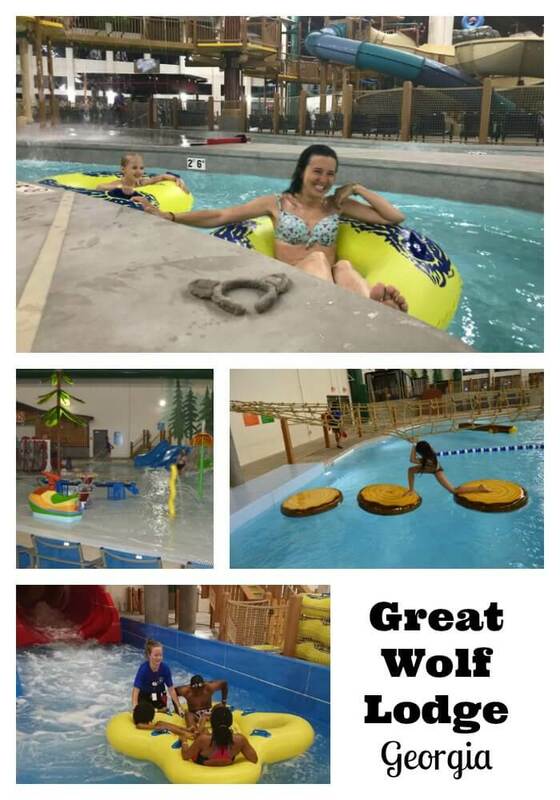 Have you been to a Great Wolf Lodge Resort before? Which of the Great Wolf Lodge Georgia attractions appeals to you most?